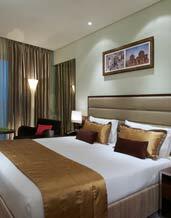 Located on the dedicated Premium 8th and 9th floors and facing either the charming city or the cool pool. These rooms are embellished with features that delight. Guests residing in Premium Indulgence rooms have access to the Rhythm Lounge - an upscale business lounge offering exclusive services (including a Bar, Internet Browsing Room, Play Station/X Box Studio, Library) Ideal for power meetings, evening soirees or even unwinding from the day's stress. They are strictly for those who like to indulge in that little extra!